Clay artworks are as varied as the populations of the world: “There are dozens of different typologies of clay,” says Clowes professor of fine arts Suzanne Blier, corresponding to different colors and textures found throughout the earth’s river banks. Viewers can admire the material’s surprising versatility on a single continent at the Harvard Art Museums’ exhibition “Clay—Modeling African Design” (through November 2021), curated by Blier, who is also professor of African and African American studies, and Jessica Levin Martinez, research curator of African art initiatives. 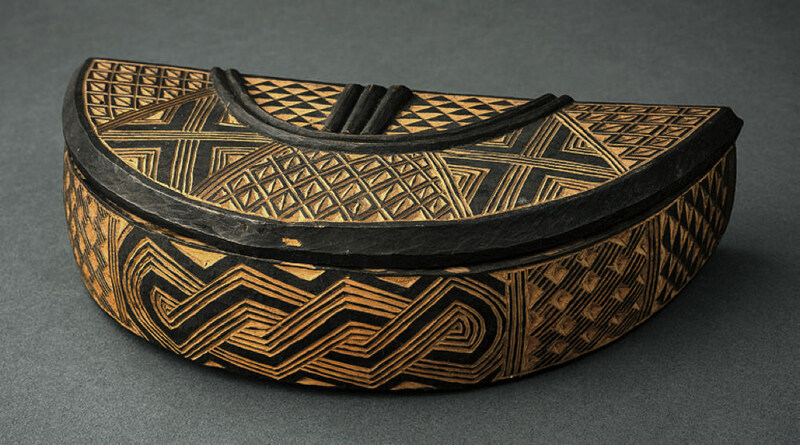 The Nile and Congo rivers define two major regions for ceramics. 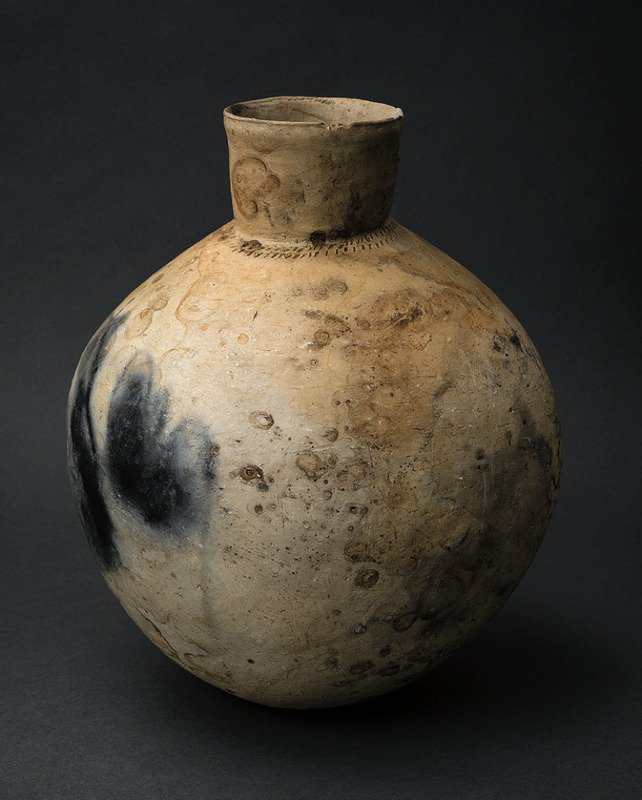 A sturdy, globular jug from the nineteenth century (above), created by skilled artisans (probably women) from the Kongo culture, would not appear out of place in a museum of modern art: its seemingly improvised watery patterns, in earthy blue, brown, and white, “evoke the Congo River itself and the way it engages different features of the landscape,” an exhibit label reads. Clay also provides a canvas for more tightly focused designs. 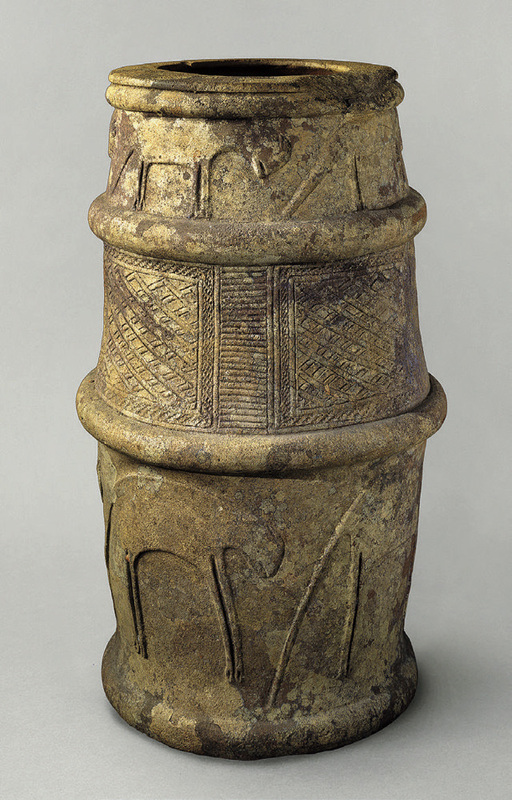 A hollow cylinder divided into three bands—the top and bottom incised with feline-like creatures representing aristocracy, the center with a checkered, geometric pattern—was probably used in funerary rituals. The longevity of ceramics may have made them practical markers for burial sites, explains Blier, and because clay comes from the ground, where the dead are buried, it is also linked to concepts about the body, ancestral spirits, and the divine. In ancient Egypt, tiny ceramic figurines made of bright blue faience were buried with the dead, to do their chores in the afterlife. Most of the objects displayed—pottery, masks, jewelry, an acoustic instrument—involve clay elements, but the exhibit also invites viewers to explore the pliability of other materials. 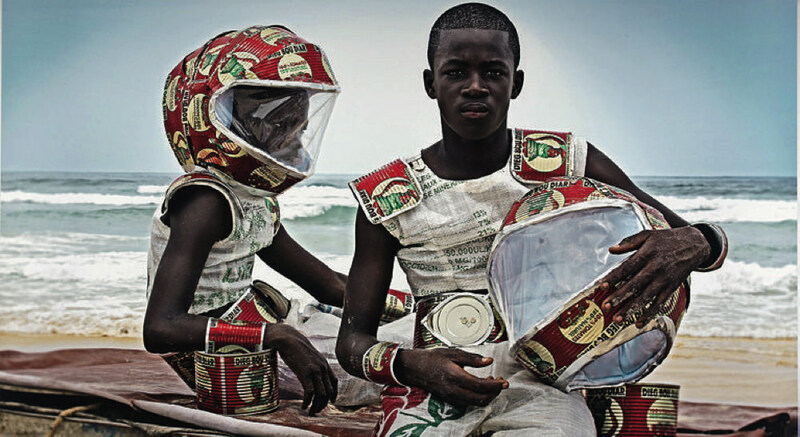 An eye-catching photograph by contemporary artist Alexis Peskine, one of the few pieces not borrowed from the Peabody Museum of Archaeology and Ethnology, shows two figures on a Senegalese beach wearing tin cans, rice bags, and plastic bottles refashioned into space-age suits. A part of the Afrofuturist movement, it combines pan-African themes with modernity, technology, and self-determination—the ability to mold a new future.